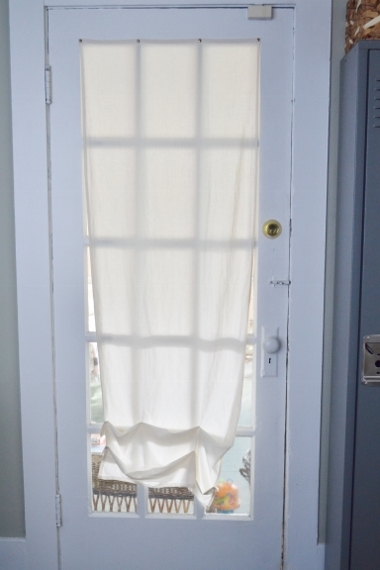 Ages and ages ago I made this simple fabric shade for the door that leads from our office/playroom to front porch. It was tacked up with a couple of brass thumbtacks at the top and had a few stitches near the bottom to make it look like a roman shade. This was pre-baby. Now I have a toddler who loves to look out windows and the shade is looking like crap because he’s pulled on it so much. I got to thinking that we almost never use this door. We have literally maybe opened it once a year since we moved in, and the last time we opened it (to move the lockers in) it took several minutes just to get it unstuck from the frame. So if we so rarely use it as a door, why not just treat it like a window? I had this extra curtain rod that I’d hoped to use in the kitchen someday, but since I recently decided to do cafe curtains in the kitchen it was no longer necessary. I asked Nick to hang it up in the office for me and he was happy to oblige. Here he is putting on the final touches while on the phone with a friend from work. 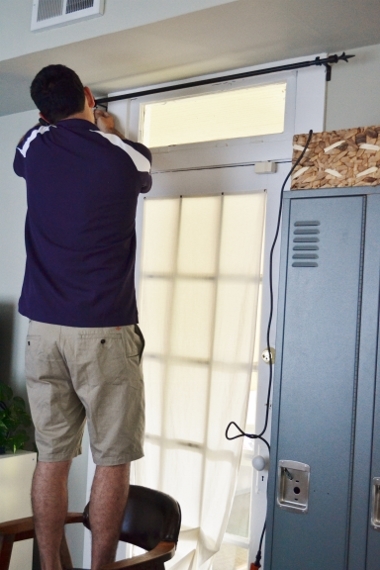 When we moved into our first place together he could hardly hammer a nail and now look at him–he’s multitasking! The hardware is an inch or two lower than I would have preferred but it’s no biggie. 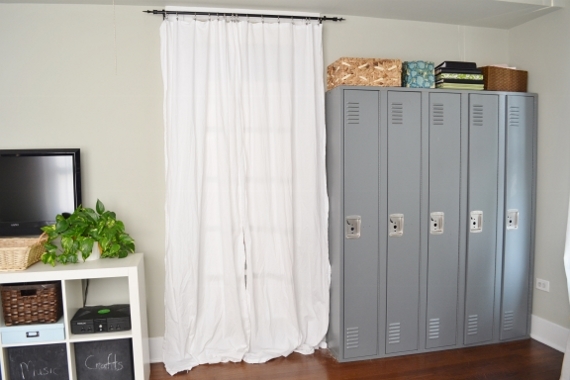 I stole some curtain panels from Jack’s room just to see how I liked it before making some more (almost all the curtains in my house are made using this technique–I still have half a bolt of white muslin stashed in one of those lockers you see below). I think I love it! At first I thought that the panels would definitely need to be hemmed but looking at the photo below they’re actually not so bad. These particular panels were always a little short in Jack’s room so I’ll probably just keep these here and make some new ones for him. I’ve been feeling frustrated lately because I could never seem to fit very much into the photos I was taking with my camera. I feel like a total idiot because as I was taking these photos I realized that I could adjust the lens to have a wider angle–how am I just figuring this out?!?! I must have accidentally adjusted it to be smaller at some point. Now I can’t wait to take new pictures of my dining room with the new setup! I can’t believe it took me so long to notice something so simple, but I’m glad that I did. Thanks for reading, y’all, and have a fabulous day! Glad you have a wide angle lens – you can also ask an iPhone 5 owner to take panoramas.